HD CableCARD tuners are becoming readily available. These credit card-sized products can be inserted into CableCARD-ready HDTVs, Series 3 TiVOs, and even some of the Microsoft Vista Media Center computers (those that have been certified by CableLabs such as DELL, Sony, and Niveus Media). Inserting this card into an HDTV is the easiest of these installations, but the downside is that you cant enjoy the benefits of an HD recording experience. Inserting CableCARDS (up to two) into a new TiVO device adds the benefits of HD recording but doesnt allow you to share your high-definition recorded content with other TVs in the home. Inserting these cards (again up to two) in a certified Microsoft Vista platform gives you the ability to record HD television and share the content around the home to up to five TVs connected to the Xbox Media Center Extender platformthe ultimate TV viewing experience. As you would expect, these good, better, and best solutions come with increasing price tags. Renting a CableCARD in the first scenario costs your client about $2.00/month. Buying a TiVo Series 3 will cost them about $700 and a certified VISTA Media Center with a couple of extenders will cost from $1,500 to $4,000 depending on the type of VISTA computing platform that they purchase. As with any new technology, there are trade-offs that you need to recognize when you choose to use the new CableCARDs. CableCARDs are OCUR (OpenCable Unidirectional Receiver) devices, which means that they are unidirectional tuners that dont allow you to get interactive services such as pay-per-view or video-on-demand across your cable line. However, if the CableCARD is installed in a Vista Media Center computer that is connected to a high-speed Internet connection, you can take advantage of web-based pay-per-view or video-on-demand services. The Online Spotlight tab of the Vista Media Center provides a number of these interactive video services. Another real benefit of the CableCARD/Vista Media Center solution is that you can now leverage the graphical interface that you use to control your TV viewing and recordings into other media and home control applications. The Media Center allows you to easily navigate from viewing and controlling your TV to viewing and controlling your photos, your music, and even your personal videos. With a number of new hardware and software peripherals from CEDIA-friendly companies like HAI, Exceptional Innovation, Superna, and others you can add home control to your TVs Media Center navigation bar. This allows your client to adjust their home thermostat up or down from their TV screen in the same logical fashion that they would adjust the TV volume up and down. This latest benefit is where the real potential of the CableCard/VISTA platform marriage shines. With all of the digital electronics that we now enjoy in the home, the greatest challenge facing most of our customers is the daunting number of remote controls and interfaces that they have to operate. 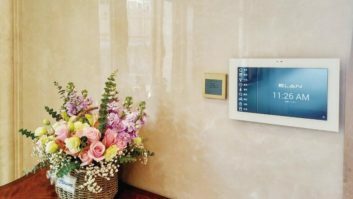 The CableCARD/VISTA platform allows them to manage and control their TV, photos, music, and even their lights and thermostats with the same initiative graphical interface. This is the same unified control approach that Apple is deploying with its music and video iTunes library extending into the living room with the companys Front Row software-controlled AppleTV product. What is missing, however, from Apples current product offering is the ability to provide TV tuning and recording capabilities, sharing this recorded content with other TVs in the home, and extending its media control platform into home control. The competitive battle between Microsoft and Apple for control of home entertainment services and content has now reached the homefront, and time will tell who will eventually be the dominant player in this lucrative market. Currently Microsoft has a clear lead with its Vista Media Center, the addition of CableCARD tuning and recording functionality, and its third-party home control extensions. But Apple may have similar visions for tomorrows digital home with a single, unified Front Row control screen competing with Microsoft Media Centers portal (and could the Apple iPhone be a future home remote control?). If they do, the next step down that road may be a CableLabs-certified Apple computer, so they can offer the same high-definition recording functionality that we now get from certified Microsoft VISTA computers today. I guess well all have to stay tuned to see who wins that battle.